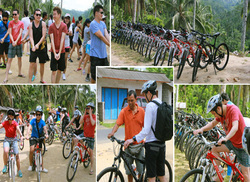 Cycling Amazing Race adds a flavour of fun to the concept of Amazing Race Teambuilding. Cycle from checkpoints to checkpoints and accomplish station games in order to clear all stations at the fastest time possible! With the bicycle as a tool to breach the distance, choices of sites to have the race is unlimited! Choose from the beautiful beaches of East Coast Park, to the fun filled island of Sentosa! If you are up to it, we can even configure a Singapore wide race for you! So book us now to make your next teambuilding program a session to remember! “Cycling Amazing Race stretches the playing ground to a whole new level! We were traveling from East Coast Park to sights such as Gardens by the Bay and the Merlion! Definitely worth the handwork and experience.